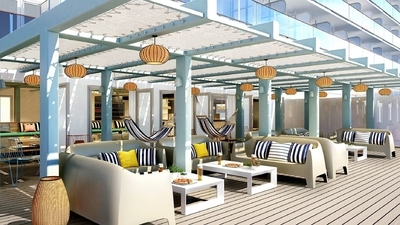 Though cruises are often synonymous with all-you-can-eat, formal buffets, Virgin Voyages is disrupting the status quo with the dining options on its Scarlet Lady ship, set to sail in 2020 from Miami to the Caribbean. While Sir Richard Branson’s inaugural cruise, with the capacity to accommodate 2,770 guests and 1,160 crew, will not hit the seas for another year, reps for Virgin Voyages announced the culinary offerings on Nov. 8. The Scarlet Lady will house 20 different eateries, from quick bites to fancy steakhouse-style meals, in the hopes of rivaling the "food scene of world famous cities," a press release stated. Reps for the cruise line confirmed via the press release that there will be “no buffet, no main dining room, no forced formal wear, no assigned seating, no assigned dining times,” on the swanky ship. Many of the restaurants will feature extended hours, and one diner will even be open 24 hours. Guests won’t go hungry while at sea thanks to a glam steak and seafood restaurant called Wake, a vegetarian-centric spot Razzle Dazzle, avant-garde fare at The Test Kitchen, a Korean BBQ restaurant called Geonbae, and more. An “elevated” Mexican restaurant, an Italian trattoria, a beach-club-inspired space serving small plates, and a food hall with eight shops will be featured as well. Wow! This is going to be so different from other ships. I'm not sure if I'm ready for it...will have to hear from others when they start the cruising on her. Will be nice for parents who want to let grandma take the little kiddos for a nice loving visit.